A two minute walk from Amsterdam Centraal Station, the Zeedijk runs from Prins Henrikkade to Nieuwmarkt and is the main street running through Amsterdam’s Chinatown. Bird has two establishments here, the main Thai restaurant at numbers 72-74 and a snack-bar at number 77 across the road. Established in 1993, Bird was the first Thai restaurant on Zeedijk. These days it is one of Amsterdam’s most popular Thai eateries, meaning there is often a queue, but this moves very fast and you usually only have a short wait for a table. We visited on a rainy Thursday evening, and waited no more than ten minutes. 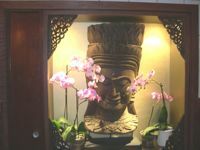 Decorated with traditional Thai statues and designs, the restaurant has several rooms located on three floors. There’s an extensive menu, available with both English and Dutch descriptions as well as a picture menu. Ingredients are fresh and the specialities are red and green curries. Starters include spring rolls or spare ribs for €4.50, various Tom Yam and other spicy soups starting from €5.50. The menu is divided into easy sections (seafood, chicken, beef, pork, vegetarian and specials) to allow you to easily pick your type of dish. Main courses include fish fillet with chilli peppers (€15), sweet and sour prawns (€17), chicken red curry with bamboo and long beans (€13), sliced beef in oyster sauce with vegetables (€15) or pork with garlic and white pepper (€13). The most expensive items are sole-based dishes (€27.50), and Bird also offers a selection of set menus. Desserts include coconut ice-cream (€3.00), and a selection of teas and coffee. We skipped the starter and opted to share a vegetarian red curry plus a Thai mixed vegetables with cashew nuts (€11.50 each). Rice is included and does not need to be ordered as an extra. Bird has a range of Thai beers, but we picked soft-drinks: cola light and tonic water (€2 each) and freshly squeezed orange (€2.50). The food arrived quickly, and the staff were attentive when we asked for extra drinks. Both dishes were tofu-based and tasty, and contained a good variety and plenty of vegetables, especially the curry which in other establishments can be more soup-like with only a few stray floating chunks. The only disadvantage to our decision to share dishes was that the red curry was much spicier, meaning the flavour of the vegetables and cashews was somewhat indistinct in comparison. Restaurants in the Netherlands are generally much more laid back about freeing up tables than many places and Bird was no exception. Although there was a queue of people waiting to sit it was fast-moving and there were no attempts to rush us into leaving after we had finished eating, so we were able to sit and chat for around an hour after finishing our meal. The bill arrived reasonably soon after we requested it, and although their web-site claims cash is the only means of paying, they accept both debit and credit cards. Our meal came to €35.70 for two main courses, four soft drinks and two coffees. Portions are generous at Bird, and good value for money. The atmosphere is relaxed and friendly and this is definitely somewhere to visit again.